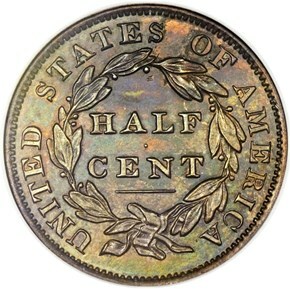 The 1833 half cent is one of the more often seen proofs of that decade. The number of survivors is perhaps two-three dozen in all. The proofs preceded the currency strikes of this date, as the former lack the prominent die-clash marks associated with most circulating coins. 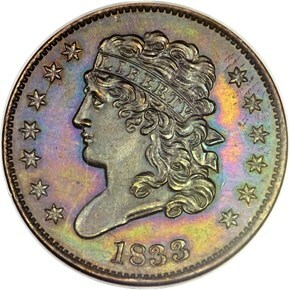 Nevertheless, some of the proofs do reveal a slim die crack within the upper stars. 4/4/2013 — Heritage Dallas Sale Claims $7.6 Million; Land of Lincoln Calling.